Really enjoying the last couple of runs. Looking forward to weather a bit more pleasant and manageable persisting with some rain. Does seem only a blip this more unsettled weather.People moaning about it makes me laugh,normally it’s a blip if we get a decent weekend over the summer months.Been spoiled too much this summer.Think of what normal summers are like in the SW,countless holidays their been ruined by the weather. 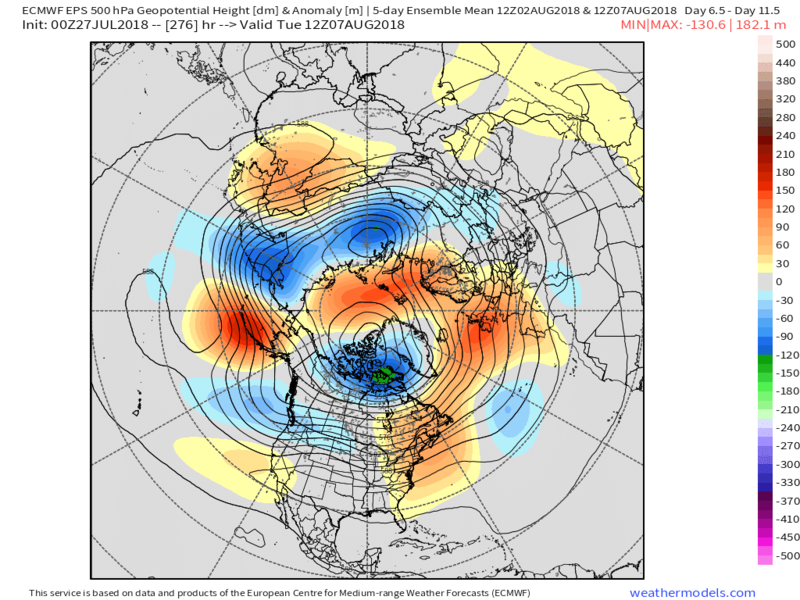 From where I'm sitting and looking at the EPS mean anomalies the likelihood of another very hot shot down the road rests with the orientation of the Atlantic trough/NW African ridge axis being In the optimum position when strong WAA would be facilitated up the western flank of the ridge catching the UK. If this is not quite right the very hot air stays in situ but the high pressure to the south still becomes influential portending temps still above average and remaining dry. Albeit perhaps more of a N/S split as the block to the east is eroded. Not sure why your post is here, sorry, glitch thing. GFS op, control and ens sticking with idea of 1 more pulse of hot air then, bingo summers over, well back to average anyway. Starting to gain some real hope this weather is on a proper change,this weekend is looking like the first for weeks that useable weather is available,ie not dripping in sweat. Certainly a move in right direction with most of the trends showing. One can hope. We certainly need the rain and a lot of it! I so hope this weather does break soon. I could just about live with another hot spell if there was solid light at the end of the tunnel but reading on the other thread, met office updates etc there really doesn't seem to be any hope anytime soon. Strong signal? Not sure what your idea of a strong signal is? Summer wont last forever, it never does, the light may come sooner. Well the average drops below the LT mean. 'Summer returning' - so a possible 2/3 days not like summer and more like other summers I dream about a cloudy 20c day with some rain, something which hasn't happened since mid-June (1mm of rain that day) to add to the grand total of 2.5mm since late May! You really can't say the next heatwave isn't uncertain or in FI.. That's the 4th ECM run in a row that doesn't show the main heat building over us. Now I don't expect, or want, us to not get any more warm settled/hot weather this summer (Surely at least a warm ridge will happen later next week I'd hope), but you can't say it's impossible that things go the wrong way and we end up morechangeable/average longer term, especially after what happened to this weekend. ECM at day 10 could even be heading that way. It's FI of course so it could be wrong, but in either direction. Although still the anomalous heat persists across Scandinavia and/or Finland. That's where the epicentre of this summer's heat anomaly has been located. 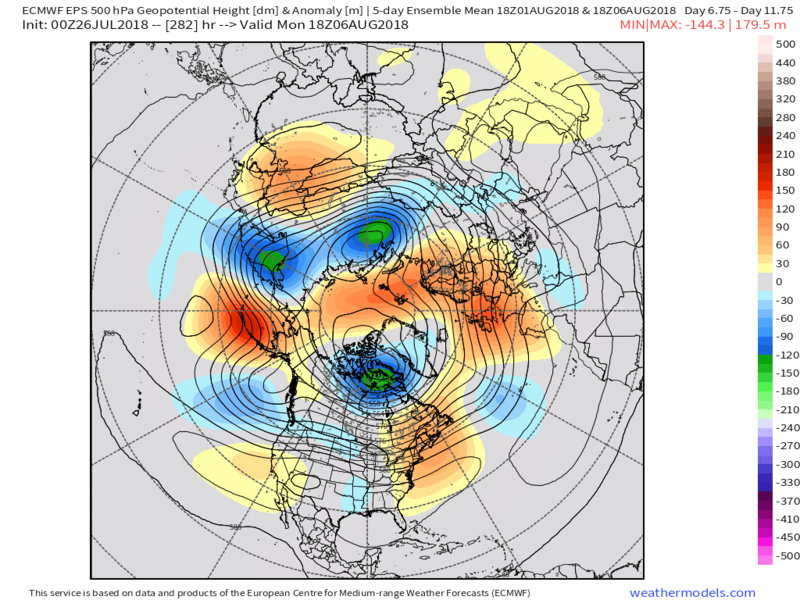 Also,I can't see how the anomaly charts can be better or pick up any trend before the model products (ensemble means etc) that they reflect, even if they are more consistent than varying operational runs longer term. Is the furnace heat stuck at 240hrs+ again, these models need some tweaking to get it right. Yet statistically they do spot the mean upper trends more successfully then the ops. I dont know how they do it either, maybe john holmes could enlighten us? He was the one who did the research. Im sure that if you check it for yourself over time youll reach the same conclusion. Though this morning all main models from what I can see don't show the heat.. if that's correct looks like the ECM operational has been on the mark and showing why it's the top verifying model. In situations like that I can't see the anomaly charts picking up the trend first, unless the brains behind any human input somehow anticipate this due to known bias/teleconnections etc (possible I suppose). I have a feeling I personally saw the hottest temps of the summer yesterday at 36oC. Looking like cooling down but still looks like a great summery period ahead. As much as I hate the heat, to experience temps that high - you have to marvel at mother nature when she shows us her extremes. john holmes did the stats when he studied them a few years ago now. so they are not an 'official' public thing, it was a personal endeavour. but ive looked at what hes said, and am still learning to interpret them properly, im very happy with their success rate even though ive written nothing down. i view these charts first, and then view the ops. i then believe the ops closest to what i understand the anoms are predicting. this method has been very accurate for the timeframe concerned (when the anoms are consistent). i do a daily blog for a local fb site after the admin for the fb read what was a blog for my family/friends. this has proved to be (embarrassingly) successful and the above method is the one i employ to create this blog. there is a market for predicting beyond the 3-4 days the bbc/media cater for. i have between 1k-1.5k views per day..
(i do make it clear that im no wizard, and all im doing in commontating on freely available info in the public domaine). so employing this method does, i suggest, act as a good guide for the ops.... see, even now you quote the current ops, and what you said is correct, but they are unlikely to be correct in themselves for the time period in question. because of the way the ops 'jump about' it makes accuracy harder to nail. interestingly, the pattern the anoms are consistently predicting but the ops are largely ignoring, is the same one tamara has been predicting, western troughing/eastern ridging, allowing for more 'plume' , southeasterly incursions. finally, lol, ive found that when theres a stand off between the ops and anoms, as in the current case where the ops refuse to recognise the troughing over the azores (pretty crucial to further extreme heat) , its the anoms that 'win' as the ops switch to agree 8/10 . the ops have switched as little as 72 hours away after a week of denial. so its not a given, but % wise the anoms spotting the coming mean upper flow has a very high accuracy rate. ..... and that chart supports the long consistent noaa anomaly charts, troughing over the azores, this is missing off the current ops and is pretty important for the possible evolution of further heat. Model thread is confusing. People seeing 27C and sunny as "downgrades" yet getting excited for cloud and 40c. Keep thinking summer is over with all the downgrade talk when in reality the downgrades are better than the upgrades. Depends what floats yer boat I guess - in any other summer we’d be raving about a few days in the mid to high 20s! This year it’s just unremarkable...mad times.